Most manufacturers produce just an Economy" and a Performance" Octopus Model Yet, even their High-End Octopus cannot come close to matching the Performance of the Atomic Safe Seconds. Each Atomic Octopus is designed and Precision-Built to Perform-as-Perfectly as its Primary Model Counterpart. So when you need it, you know exactly what to expect. The Z2 Safe Second Stage features Critical Metal Components of the Demand Valve that are made of Titanium or 316 Stainless Steel and is Completely-Corrosion-Proof. The Demand Valve Housing is Machined from Brass and Plated with an Exotic Zirconium Plating that Exponentially Outlasts Conventional Chrome Plating. The Atomic Z2 Octopus Diaphragm is made from High Quality Silicone Rubber. This Pneumatically-Balanced Poppet Second-Stage has Atomics Patented Seat Saving Dynamic Orifice which unlike most Second-Stage Orifices is a Floating Valve Design which Reduces Wear on the Second-Stage. Poppet Seat when the Regulator is not pressurized adding Life to this Important Seal. 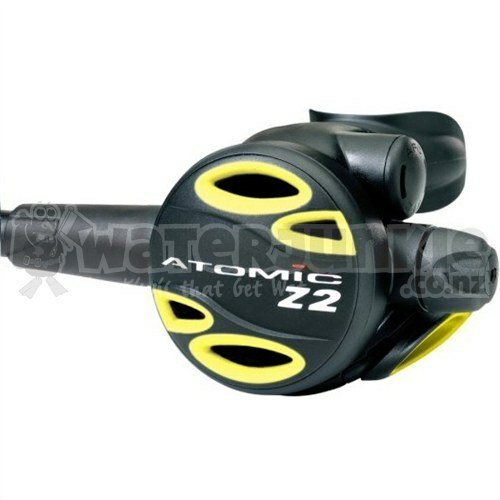 The Z2 Second-Stage Regulator is equipped with Atomics Patented Automatic Flow Control (AFC). This Unique Diaphragm Activated Vain Automatically Controls the Flow and Venturi-Effect of the Second-Stage for Optimum Breathing Resistance at all Depths. The Second-Stage does have a Rapid Adjustment Knob for Manual Second Stage De-Tuning in Rare Special Situations. The Z2 Octopus has a Bright Yellow Front Cover for Easy-Identification in an Out-of-Air-Emergency and a 36" (91.4 cm) 3/8" Threaded Low Pressure (LP) Hose. The Regulator is also equipped with a Dual Silicone Comfort Fit Mouthpiece with Tear-Resistant Bite Tabs, weighs 12.3 oz (349 g) with the Hose and is covered by a Limited Lifetime Warranty.